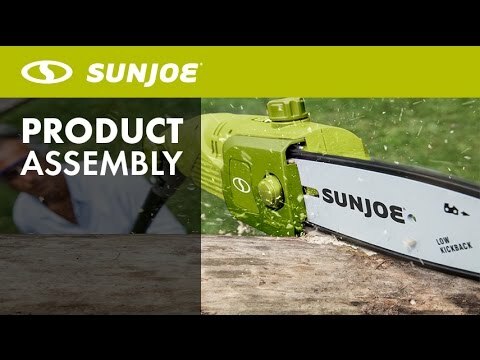 The Sun Joe SWJ802E is our most recommended electric pole chain saw – easy to use, lightweight, inexpensive and the adjustable head is a nice bonus. Perfect for an occasional homeowner use. The SWJ802E comes with the classical advantages and disadvantages of corded tools – it’s fairly cheap, very easy to use, you don’t have to worry about battery running time or mixing fuel. On the other hand, you have to stay within the reach of an extension cord. It requires only a little assembly (see one of the videos above), you just attach the bar and add oil (which is not included). According to the users it’s well designed, sturdy and works great. The maximum length is about 9 feet so it offers a reach of approximately 14 feet from the ground, depending on your height. The pole extends easily and works fine even at full extension, just be prepared it would take a bit of strength – the balance shifts away from you at that length. But that’s a common issue of all pole chainsaws. And what about the cutting capabilities? Of course, don’t expect the power of gas machines, but it provides enough power for a classical homeowner use. It’s fairly quick and cuts through 6" branches easily. The saw itself is not detachable but that also makes it lighter and more maneuverable when extended. And you can still use it to cut the fallen limbs into pieces on the ground after you collapse the pole – it’s not ideal but definitely manageable. The top feature of this pole saw is probably the multi-position head, you can choose from a 0, 15 or 30 degree angle. And users really like this feature, it’s much easier to rest the saw on the limb and let the gravity do its job – no more pushing against the wood or forcing it to stay in place. The automatic lubrication works well, two users reported some leaks but most did not experience any problems. Just make sure to check the plastic reservoir window and add oil if needed (a small funnel works best). It’s recommended to drain the reservoir before storage or you can keep and old towel under it in case it drips oil a bit. 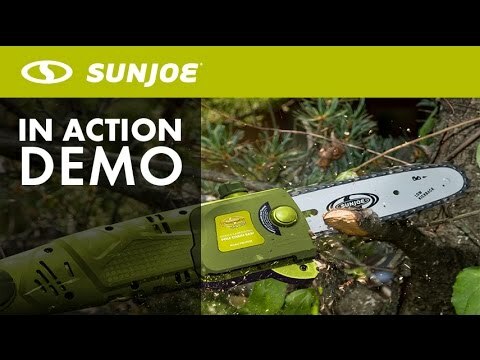 Conclusion: If you want a quality and inexpensive pole saw and don’t mind using a power cord, Sun Joe SWJ802E would be a perfect option for you. It’s lightweight, easy to handle and the adjustable head is a great feature – we can definitely recommend it. However, it is still intended mainly for occasional homeowner use – for more frequent pruning, take a look at these tools. Are there any accessories I should buy? If you don’t have a long extension cord yet, go with the Coleman 100 feet cable. Also, you would need some oil for the chain (it’s not included) – for example this one. The motor is an enclosed unit so no maintenance is required. You’ll just need to adjust the chain tension if needed (very easy to do) and also fill the oil reservoir when it becomes empty. How to replace the chain?